Plastic Bags vs Paper Bags which is more Earth Friendly? Keeping all trash out of the waste stream as long as possible is key to helping the environment. When the bag can no longer function, customers should seek out a recycling program in their area. For a geographical listing of stores accepting bags for recycling in your area click here. Note: Food grade bags must be manufactured with FDA approved materials and can not contain recycled material. Are plastic bags getting a bad reputation? Look in almost any newspaper and more than likely you will find an article about local government that is considering to somehow regulate plastic bags. It is becoming easy to hate the "pitiful" plastic bag! Articles usually leave out the facts as well as the side by side comparison. 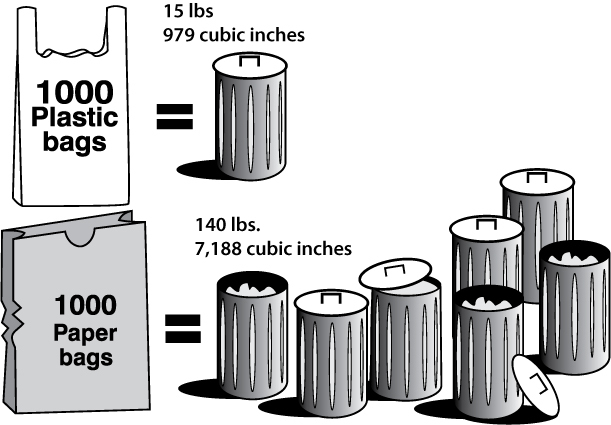 A truthful look at what is required to produce 1000 plastic bags versus 1000 similar paper bags. If the biased media would present the facts, as discerning people we could make educated and wise decisions. Without overloading you will all the tried and true data there is a new additive that can be put into HDPE plastic bags. It helps the Polyethylene molecules biodegrade. This process takes place aerobically or anaerobically. It can happen with or without the presence of light. Even in landfill conditions which are normally not conducive to bio-degradation, this action can occur. Paper can discintegrate or biodegrade when air and moisture are present, neither of which are abundant in landfills. What is the root issue with plastic bags? Plastic bags do not “down cycle”, meaning plastic bags can produce plastic bags infinitely. On the other hand, paper has a limited recyclable life span. The fibers deteriorate too much after continued re-pulping. At the end of papers recyclable life it can only be used in fillers and lower grade materials. Paper and plastic are easy to recycle these days. Paper costs more and requires more energy to recycle. Plastic bags are ground up, extruded and in minutes are new plastic bags. Green Plastic bags made from agriculture? PLA (corn based) plastic bags are not recyclable! It is “Compostable”. There is a vast difference. "Corn" bags would disrupt the recycling of normal PE plastic bags and to begin with they cost as much as paper. PLA is great for many products, just not grocery bags in our opinion. Are plastic bags made out of oil from overseas? There is less foreign oil used to make plastic bags than there is to make paper ones, due in part because less energy is required. True, some PE is made from oil derivatives; but take a look at the source of that poly resin. In years past, Asian resin was used to make the plastic bags. Currently the Asian governments no longer controls PE resin. Today's sources come from home and start from Natural Gas and a by-product of the distillation of crude oil (foreign or local) but not the oil itself. Ethane Extraction is advancing in the scientific community with exciting new developments and research. Fewer and fewer new materials, ethane or otherwise are needed to make plastic bags. Both paper and plastic when made in the USA from recycled US materials by emission reducing processes are not particularly bad, they just have different properties. Recycle: Returning a product for reprocessing into another type of product which would use the components of the original product in its makeup. This is not remaking the old product in a like new product. Recycling reduces the need for additional raw material for the production of bags. Recyclable: Product wich can be collected from waste and made into another product. Reduce: Using less of something, or use alternatives with less bulk to reduce the content going into landlls. Re-use: Use again, at least once. A single re-use of a bag will reduce the number of bags going into a landll by 50%. Biodegradable: Materials capable of undergoing biological anaerobic or aerobic decomposition by the action of microorganisms such as bacteria, fungi and algae under conditions naturally occurring in the biosphere. Compostable: Materials that undergo degradation by biological process during composting to yield CO2, water, inorganic compounds and biomass at a rate consistent with other compostable materials in commercial/industrial composting conditions and leave no visible, distinguishable or toxic residue. Degradable: Materials that have the capability to break down from a whole into parts or completely break down into natural substances in the normal process of exposure to natural events. Most degradable products are either biodegradable or photodegradable. Degradable bags cannot be recycled. Post Consumer Recycled (PCR): The product discarded by consumers after use, which is seperated, then added to new resin material to produce plastic bags. In order to retain the integrity and strength of the bags during use, no more than 25% PCR is used. A bag containing PCR material and one without is minimal or unnoticeable. Post Industrial Recycled (PIR): Generally plastic scraps and cuttings from plastic bag extrusion. Recycling eliminates any waste from ending up in a landll. Shelf Life: Blank or printed degradable bags have a 12 to 18 month shelf life, under normal storage and temperature conditions. Storage is dened as a closed container away from sunlight. Educated people make educated choices. Plastic or paper? You decide, both are good and sustainable products.